In this photo gallery, enter the operating room and see a canine castration, more commonly known as dog neuter surgery. This procedure requires general anesthesia maintained with inhalation (gas) anesthetic. Many veterinarians also give IV fluids, monitor heart and respiratory rates, blood pressure, oxygen saturation levels, and give medications to control pain during this surgery. This photo gallery focuses on the surgery steps. Speak to your vet for specific anesthesia and anesthetic monitoring protocols. Neutering is a sterile surgery, meaning one where every precaution is taken to keep the surgical area as clean as possible. After the dog is under anesthesia, the vet techs or veterinarian shave the surgical area and scrub using a skin cleanser. The scrubbing is done in a circular motion, starting small at the incision area, and widening out with each circular stroke. This ensures that the incision area is as clean as possible. The incision for a dog neuter is made just in front of the testicles and scrotum. This is because the scrotal tissue is thin, very sensitive and bleeds more than the skin incision. As mentioned in the previous photo, the incision is made in the skin, just in front of the scrotum. Each testicle is pushed up and through this incision. There are two ways to do a dog neuter: open or closed castration. There is no "right" or "wrong" way to do a neuter; often is it the choice, training and comfort level of the surgeon performing the surgery. In an open castration, the tunic, the tough membranous covering of the testicle and associated structures, is incised. Each structure is ligated (tied off) separately. 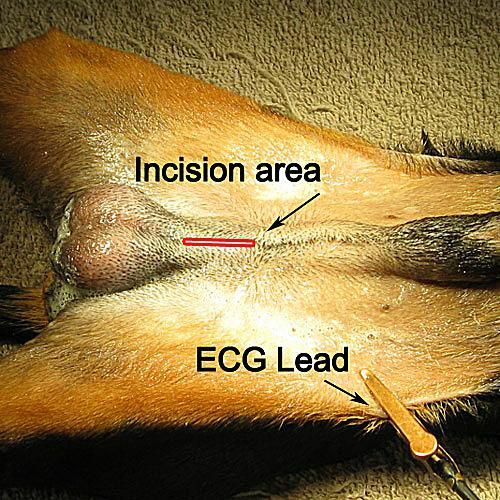 In a closed castration, the tunic is not incised, and the vessels, vas deferens, and associated structures are ligated at once, usually with two or three separate knots to prevent bleeding. This photo gallery demonstrates the closed castration method. The surgeon has clamped the vas deferens (spermatic cord), pampiniform plexus (vessels around the vas deferens), cremaster muscle and arterial supply. A dissolvable suture, usually a synthetic monofilament, is used for the internal ligations (knots) around the vessels, vas deferens, and thin cremaster muscle. There is always some danger that the vessels may slip out of a knot. Transfixing ligatures help to ensure things stay where they should and no bleeding occurs. A needle is used to thread the suture gently between the vas deferens and vessels. The suture is then wrapped around everything to secure the knot. This is called a transfixing ligature or suture and helps keep the knot in place to prevent bleeding or seepage from the vessels. The skin is closed using the same dissolvable suture that was used to ligate the testicles. The incision is usually very small and the closure is in two or three steps. The first closure brings the skin edges together, and the second layer closes the subcutaneous level. This way, there aren't any sutures visible (or lickable) on the outside skin surface. Some vets use surgical glue for the third level of closure. Some veterinarians use non-dissolvable sutures that will need to be removed in 10 to 14 days. In cases of a very active dog or one known to lick, sometimes wire sutures are used, they add strength and the prickliness discourage licking. They also need to be removed in 10 to 14 days. The incision in this small dog is less than one inch long. The dog is now ready to be woken up from anesthesia. Surgical glue "seals" the skin edges together for minimal bleeding and maximal comfort. Surgical glue helps prevent any minor seepage from the incision. The incision is small and will heal nicely. Dogs must be kept quiet and discouraged from licking the surgical area for fastest healing. The dog in these photos is a young dog. The scrotum will shrink over time and not be visible. Larger dogs, and especially dogs neutered at an age greater than 6 months, may have a residual empty 'sac' remain. The scrotal tissue is not routinely removed unless there is diseased tissue present. This is because ​the scrotal tissue is sensitive and bleeds more than skin. For some dogs, closure of the area may be a problem if a lot of tissue is removed. The scrotum also has a thin sheet of muscle, called the tunica dartos that may contract or bleed. However, opinions vary on this. Some veterinarians prefer to remove the scrotum on larger, older dogs. There is usually an additional charge for this. Speak to your veterinarian if this is a concern for your dog.